MAN Diesel & Turbo’s dual-fuel MAN L23/30DF engine has successfully passed its Type Approval Test (TAT) on 2 November 2017 at CSSC Marine Power (CMP) in Zhenjiang in front of the industry’s main classification societies. The five-cylinder test engine in China had an output of 125 kW per cylinder at a nominal speed of 720/750 rpm. Dual-fuel safety concept, including a test of the pilot-fuel system. 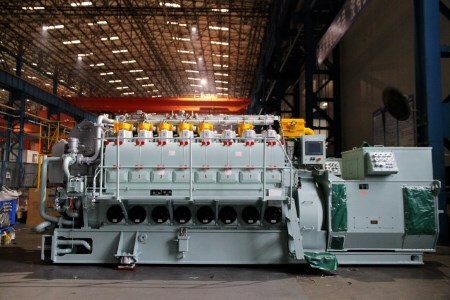 The MAN L23/30DF engine was also granted a certificate for compliance with IMO Tier III regulations in gas mode without any after-treatment equipment. In addition, the engine can provide up to 110% power output in both gas and fuel modes. ESL Shipping, the leading carrier of dry bulk cargoes in the Baltic region, has already ordered the first six L23/30DF GenSets for two 25 000 DWT cargo carrier newbuildings, currently under construction at CSC Jinling ship yard in China.